FS: Seamaster Chronograph Automatic Chronometer Blue, Co-Axial, Ceramic bezel. Near Mint. FS: BNIB Rolex Submariner Non Date Ceramic 114060, with all the Stickers, Untouched, Complete. FSOT: Panerai 279 K Series Luminor Marina Automatic,Chocolate Tobacco Brown Dial, Titanium Complete. FSOT: Panerai Luminor Marina GMT 1950, PAM329 Q Series Automatic, Black Dial, Steel Complete. 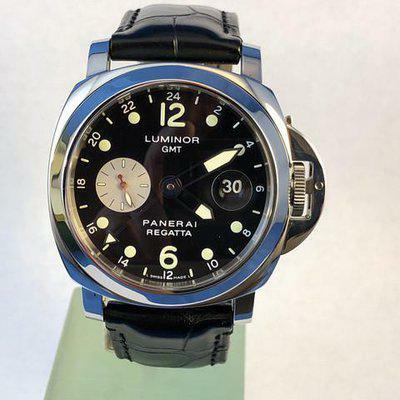 FS: Luminor Panerai PAM156 GMT Marina Regatta Limited Edition 2002. 44mm Stainless Steel, Automatic. FSOT: Vintage Rolex Date, Vintage Steel, Ref. 1500 on Bracelet, Sunburst Silver Gold Dial. Final Price Reduction. FS: Rolex Submariner Non Date 4 Liner 14060 Random Serial 2011. Last Year made, Complete. FS: Limited Edition Panerai, 2008 Luminor Marina Regatta Chronograph PAM308 Complete. FS: Rolex Explorer II 16570 Black, SEL Bracelet, Y Serial 2003, No Holes Case, Just Fully Serviced. FS: Breitling Navitimer World GMT, 46mm. Complete. Black Dial, Rubber & deployment buckle.